WASHINGTON, Nov 13 (IPS) - The United States proposed Tuesday that the international community write off 100 million dollars in debt owed by West African countries hit hardest by the current Ebola outbreak. The money would be re-invested in health and other public programming. "The International Monetary Fund has already played a critical role as a first responder, providing economic support to countries hardest hit by Ebola," Lew said in a statement to IPS. "Today we are asking the IMF to expand that support by providing debt relief for Sierra Leone, Liberia and Guinea. IMF debt relief will promote economic sustainability in the worst hit countries by freeing up resources for both immediate needs and longer-term recovery efforts." These three countries together owe the IMF some 370 million dollars, according to the U.S. Treasury, with 55 million dollars due in the coming two years. 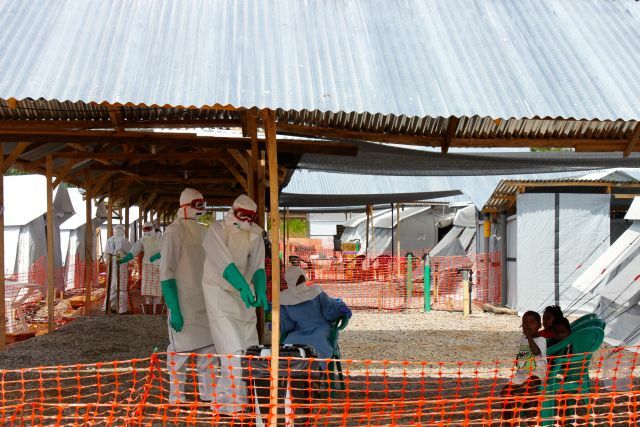 Yet there are already widespread fears over the devastating financial ramifications of Ebola on Guinea, Liberia and Sierra Leone, in addition to the epidemic's horrendous social impact. Last month, the World Health Organisation warned that the virus now threatens "potential state failure" in these countries. The World Bank, meanwhile, estimates that the virus, which has already killed more than 5,000 people and infected more than 14,000, could cost West African countries some 33 billion dollars in gross domestic product. That's because the plan would see the IMF tap a unique fund set up in the aftermath of the 2010 Haiti earthquake, which facilitated the cancellation of nearly 270 million dollars of Haitian debt to the IMF. Called the Post-Catastrophe Debt Relief (PCDR) Trust, it is aimed specifically at responding to major natural disasters in the world's poorest countries. "Our proposal is for the IMF to provide debt relief for these Ebola-affected nations from this trust," the spokesperson said. "The U.S. would like to see around 100 million dollars put toward this effort, however the precise amount will need to be determined in consultations with the IMF and its membership." "We are very glad that some donors have expressed an interest in increasing support for the Ebola-affected countries. We are reaching out to all donors to see how we might be able to take this forward … using all the tools available to us," an IMF spokesperson told IPS.
" decisions are made according to the merits of the particular case and this would be approached in the same way. We would expect the Board to be briefed soon on this topic." For development and anti-poverty advocates, debt obligations on the part of poor countries constitute a key obstacle to a government's ability to respond to critical social needs, both in the short and long term. "As bad as Ebola has been, some of these countries have far greater challenges with debts from malaria than from Ebola," Eric LeCompte, Jubilee USA's executive director, told IPS. "The amount is incredibly important because it cancels a significant portion of the debt completely. And the plan is for that money to be re-invested in social infrastructure, including hospitals and schools … to deal with the short-term problem of Ebola but also the long-term failure of the health systems that allowed for this outbreak." LeCompte was also involved in the creation of the Post-Catastrophe Debt Relief Trust, in the aftermath of the Haitian earthquake. His office has advocated for the fund's monies to be used since then – for instance, to react to flooding in Pakistan and Typhoon Haiyan in the Philippines. "This is a very clear opportunity to point to the 150 million dollars left in that fund and to note that Ebola is every bit the same as the Haitian earthquake in terms of being a regional calamity," LeCompte says. "The difference is that this is also a long-term investment in the very problems that allow Ebola to spread. So we'd be not only addressing the current issue, but also the next disease outbreak in that region." It is unclear whether there is a mechanism in place to top up the PCDR Trust in the future. The IMF states that "Replenishment of the Trust will rely on donor contributions, as necessary." But for his part, LeCompte says the fund has the potential to fill a significant gap: offering a pot of money, immediately available, that could be quickly mobilised to deal with true crises afflicting the world's poorest countries, from hurricanes to major financial defaults.